You may suffer from the same pain as Ellen did, “I accidentally dropped my iPhone 6S into water and want to know how to recover data from my water damaged iPhone. Can it be recovered? Does anyone know how to deal with it? ”. According to physical standpoint, your iPhone faces potential damage when it is in close contact with water. In this case, you shall still remain hopeful, as you still have chance to repair it and recover data from water damaged iPhone 7/7 Plus/6S/6S Plus/6/6Plus/5S/SE,etc. Firstly, DO NOT TRY TO USE IT. Take it out from water and turn it off. Remove everything from iPhone, including headphones, any cords and SIM card. Now try to shake it to get as much water out of your iPhone as possible. Blow dryer is also a useful tool to remove water from iPhone. Most people searched online and find that one of the options to save water damaged iPhone is to put it in rice. Actually, it rarely works. You’d better try with other useful options. Keep in mind that never charge the iPhone or turn it on for at least 24 hours. After 24-36 hours, you can try to tun it on. If it still doesn’t turn on, you are required to charge it for longer time until it restarts. What if it doesn’t turn on however long you wait? It may be damaged and you have to go to the repair shop to fix it. Normally, your iPhone data may get lost. 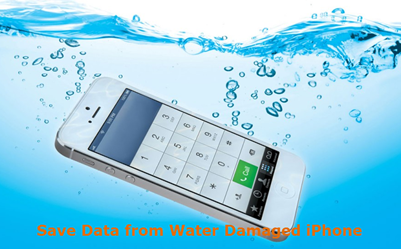 In which case, you can read below to get idea of how to retrieve data from water damaged iPhone. Most people are not in the habit of backing up their iPhone, iPad with iTunes or iCloud. 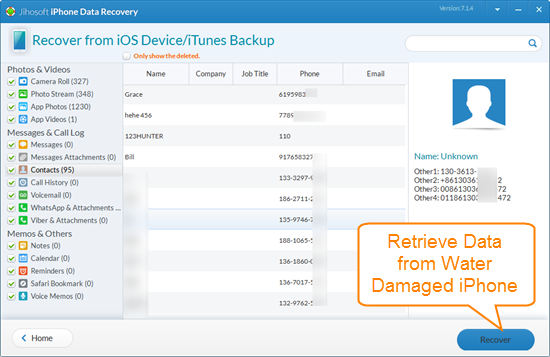 In this case, iPhone Data Recovery can come in hand to recover data from iPhone, iPad and iPod Touch. It can help you retrieve lost files, such as contacts, messages, pictures, videos, notes, WhatsApp, etc directly from iPhone or iPad. Note: when you are using the software, please ensure that you have installed the latest version of iTunes on your PC. Simply follow the step by step guide of it to get back the data. 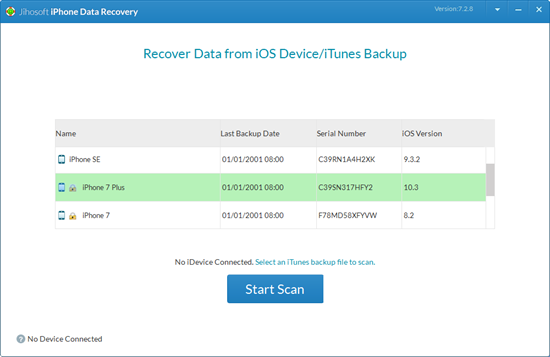 If your iPhone doesn’t work anymore, you can extract data from iPhone backup with this program either. 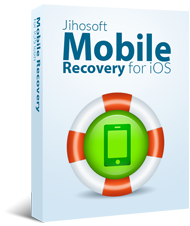 Step 1: Run Jihosoft iPhone Data Recovery, ignore the hint of connecting iDevice to computer and click Next. Step 2: Then you will see all your iTunes backup files listed, choose one that you want and click “Start Scan”. Step 3: After the scan, selectively choose data you want and click “Recover” to export them to computer. Copyright &COPY; 2019 Free iTunes Backup Extractor. Jihosoft All Rights Reserved.